A checking (Share Draft) account is necessary even if you don’t write checks! Use your Check Card at ATMs and to make purchases just about anywhere. Use your Check Card to make purchases or to get cash from ATMs. In CU Online, enroll in our online Bill Pay service, and deposit checks with a smartphone using mobile check deposit. Accounts without Direct Deposit or not maintaining a minimum balance of $500 will be charged a monthly service fee, Members with checking accounts in good standing are eligible to use our online Bill Pay and mobile check deposit service. Use your Check Card to make purchases or as an ATM card to withdraw cash from your savings and checking accounts. Avoid ATM surcharges by using Allpoint ATMs or our Saint Agnes Hospital ATMs. To activate your Check Card, call 800-992-3808 or make an ATM withdrawal or balance inquiry using your PIN, mailed separately from your card. Report a lost or stolen Check Card to 800-472-3272 as soon as possible. Five Star Federal Credit Union belongs to the Allpoint surcharge-free ATM network, with 55,000 ATMs in stores, pharmacies and gas stations. 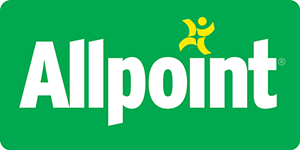 Visit the Allpoint website and type in your zip code or use our Mobile Banking app to find Allpoint ATMs. Allpoint locations subject to change. Fees apply for cash advances made with credit cards. What makes our debit card different from the others? Register online for the free uChoose Rewards program to earn points and redeem gift cards, merchandise and other offers. You'll build up points when you make debit card purchases choosing "credit" (signature) instead of "debit (PIN) when your current Check Card number is registered on the uChoose Rewards site. PIN purchases and unregistered debit cards don't earn uChoose Rewards points. If you receive a replacement card with a different number, please register the new number to earn points. We offer many designs for duplicate-style checks; the cost of different check styles will vary. Visit our online check ordering site or a branch office to order checks. Overdraft protection is provided for all checking accounts as a transfer from your Share Savings account. There is a nominal fee for overdraft protection transfers. Only six electronic transfers are allowed per month (including online, mobile, telephone teller and ACH). If you have questions about overdraft protection transfers, please visit or call a branch.